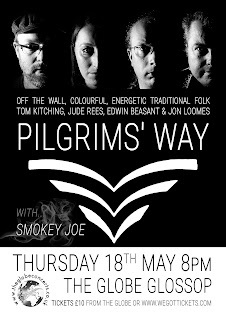 Pilgrims' Way - Off the wall, colourful, energetic. With influences starting in early music, passing through Playford and the Morris traditions, picking up prog, soul, and pop, it's impossible to categorise the sound they make as folk music is fed through their unique steam driven sound-mincing engine. Formed by default under a Stockport pub table in early 2010 by Ed, Tom, and past member, Lucy Wright, Pilgrims' Way has grown to incorporate a dazzling array of instrumentation and millinery. With the extraordinarily omni-skilled musician Jon Loomes (22 instruments played on Red Diesel! ), and champion Renaissance woodwind parper and oboe wrangler Jude Rees joining along the way, the prospect of an early night is slim. "The Handweaver and the Factory Maid is one of my favourite tracks of the last 12 months!" "It has to be in contention come next awards season." R2 Magazine.